Multigrain food itemsare the latest fad and are available in the market in innumerable avatars, from flour and bread to noodles and biscuits. This mix of grains, either just cereals or a blend of cereals and pulses, is touted as healthy, with high nutritional value. Food companies are spending millions of rupees to promote multigrain products. But when one reads the history of Indian food, it becomes evident that multigrain food has been part of the Indian diet since ancient times. K T Achaya, an eminent food scientist, nutritionist and food historian of the country, writes in his book, The Story of Our Food, that the concept of blending different types of proteins by mixing cereals and pulses was known during the Aryan times in 1500 BC. It is now well known that such food items contain higher amount of proteins than either of the cereals or pulses. In addition, the mixture is fermented so that it becomes easily digestible and more nutritious, he writes. Soak rice for three hours and the pulses for half-an-hour. Some prefer soaking black gram for a good two hours or more. Strain the grains, add green chillies, red chilli, asafoetida, salt and curry leaves to the mixture, and grind coarsely. Allow the batter to ferment for a few hours. This gives the adai a sour flavor. One can also make adai half-an-hour after grinding. Spread oil on a flat frying pan. Since adai is thicker than dosa and is more like tandoori roti, spread two spoons of batter on it, as opposed to one spoon of batter for dosa. It is customary to make a tiny hole with the spatula in the centre of the adai and pour a wee bit of oil in it. This enables the oil to spread well within the adai and, of course, helps it cook faster and better. Some prefer making adai by patting the thick batter on the skillet by hand. Turn it over till both sides turn golden crisp. Serve hot with dollops of white butter, jaggery, honey, gun powder or chutney of choice. One example of such blended food is adai. Achaya describes adai as a shallow fried circlet of “the Tamil country”. “The thickly ground batter consists of almost equal parts of rice and as many as four pulses. It is described in the Tamil Sangam literature between the third and sixth centuries AD as a snack served by vendors on the seashore,” he writes. The initial reference to adai can be traced back to Silappadikaram (one of the first epics in Tamil written by Elangovan in the 1st century AD), and Mathuraikanchi (a collection of poems written in the Sangam era, from 3rd century BC to 4th century AD). Silappadikaram depicts a scene along the beach where vendors are selling crisp adais. This shows that street food in India has a history. Today, the shallow fried, thick adai is made and eaten more in homes as a popular breakfast item. It does not find a place of pride in restaurant offerings which favour the ubiquitous dosa and uttappam. It could possibly be because adai takes longer to cook. By the time an adai is made, several dosas can be churned out. So dosas are value for money as opposed to adai. In contrast, adai is ideal for a homemaker as it does not require standing next to the skillet to turn it over. One can leisurely leave it for a good several minutes and attend to other kitchen chores. Also, fewer adais need to be prepared as they are thick and filling. The best part of adai is that it can be made with as many combinations of lentils as one likes. This includes a number of rarely consumed nutritious pulses, such as black gram or urad, the vegetarian equivalent to meat, and horse gram or kulath. Adai made using kulath is very tasty. Adai is often eaten on the days of fasting when meals are typically restricted to phalaharam, or meal of fruits, and certain grains. Depending on the austerity, people mix the grains and enjoy a balanced diet. Each house has its pet recipe for adai. The variation usually depends on the combination of pulses with rice and, of course, seasoning. Since certain pulses can cause flatulence, black pepper, cumin seeds and asafoetida are traditionally added to adai to help in digestion. But there are those who add red chillies instead of black pepper and coriander leaves instead of curry leaves or use ginger, green chillies and curry leaves for seasoning. Some add a whole range of leafy vegetables, including cabbage, spinach, fenugreek and moringa leaves, while others add small pieces of coconut to enhance the taste. To suit the contemporary palate, many treat adai as a pizza base and top it with onions and tomatoes, or even eggs, mushrooms and olives. 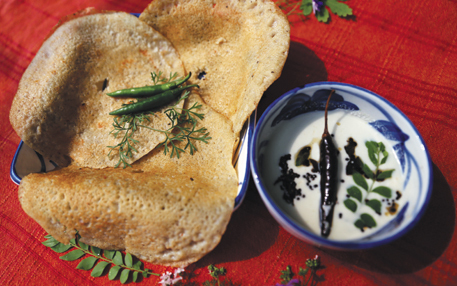 Another fact that works for adai as a favourite breakfast food is that it can be eaten with a host of assortments, be it honey, jaggery, podi or gun powder, pickles or chutney. But the best accompaniment of adai is butter, preferably white. A hot adai topped with butter is soul satisfying, and can never be compared with the market-innovated multigrain food items. Live in bombay and though people throng to madras cafâ”œÂ® and other south Indian restaurants in matunga area (near dadar central) , adai is not served anywhere. I personally love adai over dosai. Ragi dosai is again uncommon. that also happens in bombay because these restaurant chains are run by udipi guys who do not know about adai. even road side tamilian serving dosai does not serve adai. Adai with jaggery is a perfect way to start my day or end it. Nothing comes close to the taste of adai. Gun powder sounds weird though. and I can't expect more from bombay where most people call it dhosa! If you can provide me space for cooking and starting an restaurant, I can get entire south indian traditional flavors like Chettinad, Karaikudi, Thanjavur break fast, lunch and dinner but only PURE VEGETARIAN. Like healthy ADAI-AVIAL, RAGI DOSA, PESARATTU, RICE UPMA, PUTTU, IDIYAPPAM, AAPAM, KOZHUKATTAI, PIDI KOLZHUKATTAI, IDLI UPMA etc....can be prepared. Similarly for lunch, very traditional handgrinded ingredients for Sambhar, Pepper Garlic rasam, Parruppu usili, Thuvayal, Kaatai, Elavadam etc....can be served.